In the modern digital space, it may be fair to say that Intel feels somewhat outdated, a relic amongst “hotter” start-ups and more successful companies jostling for the attention of today’s customers. Hence the creation of iQ by Intel, a new digital magazine that, it’s hoped, will help the company reconnect with younger audiences. 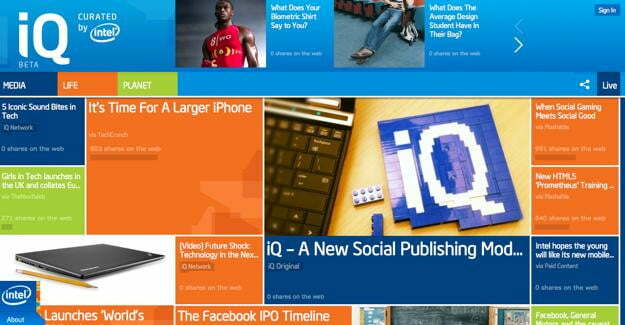 A content aggregator designed for mobile reading – the site is optimized for tablets and smartphones, and mixes content from sites like TechCrunch, Mashable and TheNextWeb with original content, curated by Intel employees – the site will run on a democratic ideal that will see users able to up-vote material to the front page, a la Reddit, with the stories also gaining visibility dependent on the amount of times they’ve been shared via social media. Stories currently available trend towards the tech-related (Perhaps a result of the up-voting from an audience that’s currently more tech-oriented on day of launch), but in future, stories including will apparently run the gamut of subjects, as long as they appeal to a youth demographic (The current beta site has three central topics: Media, Life and Planet. So, nothing too vague, then). The importance of the age of the readership cannot be overstated, according to iQ Editor-in-Chief Bryan Rhoads. Talking to AdAge, he said that the magazine’s goal is to “connect with a younger audience and tell them the bigger story of who [Intel is] as a brand. Many of them don’t know, so we need to tell them the story of Intel that is beyond PCs and beyond processors… We have Facebook, Twitter and blogs and all of that, but they’re really not tailored to a younger audience.” That last statement is interesting, if only for it raising the question of how young this younger audience actually is – After all, Twitter and Facebook don’t skew dramatically old, traditionally (Well, Twitter doesn’t, at least); I’d be curious to see data on the ages of Intel’s 10 million Facebook fans or 250,000 Twitter followers, and see if they provide illustrate unusually older audiences. Nonetheless, Rhoads is excited about the potential of iQ, calling it “not necessarily a destination, but more of an engine and platform to get out into Facebook and Twitter. You don’t have to come to iQ, but you’ll be getting iQ stories in your news feeds and streams.” Attention, youth of the Internet: Intel is calling. It’s up to you to decide whether or not you’re ready to answer.